, also dubbed the ‘Mediterranean of Japan’. It’s a region rich in art, natural beauty, tradition and religious heritage, all of which make it one the country’s most popular tourist attractions. The present Shinto shrine dates back to the 12th century and is a UNESCO World Heritage site. 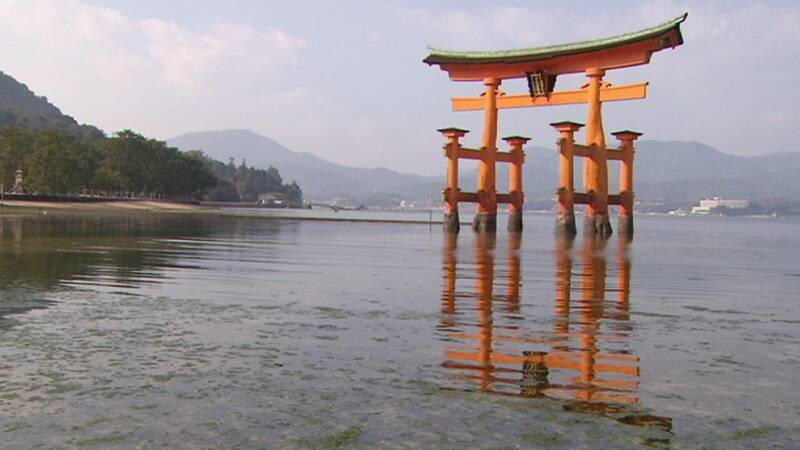 For centuries ordinary people weren’t allowed to set foot on Miyajima. “As the whole island was considered sacred, it was worshipped. Therefore it wasn’t possible to live on the island, nor to build houses,” said Michinori Fukuda. Our journey through the Seto Inland Sea continues to Onomichi, the gateway for the over 60 kilometre long “Shimanami Kaido”, an expressway that links six small islands and features bike lanes all along the way. The members of the Onomichi Cycling Association come here every week to enjoy the country’s most exciting cycling course. Sublime views and architectural marvels line the way. “It’s a paradise for cyclists,” said one of their group. “It’s great. It’s great!” enthused another. Among the treasures of this route is the Tatara Bridge, one of the world’s longest cable-stayed bridges. The elegant steel towers reach a height of 220-metres. It’s always a special moment for the group to cross this bridge at such a dizzy height. , also known as the ‘Island of Art’. Just a few decades ago this island was a sleepy fishing community. Today Naoshima boasts contemporary art as far as the eye can see. The small island showcases installations, sculptures and museums. Several of these architectural jewels have been designed by the world renowned architect Tadao Andō. “We thought about the landscape of the Inland Sea and asked ourselves how best we could design an architecture for this gentle landscape that was in harmony with the people,” Ryoji Kasahara, Head of Art Management, Fukutake Foundation told us. A perfect example of this is the Chichu museum. ‘Chichu’ means ‘below the earth’ and most of the museum’s structure is underground in a hilltop. The space was constructed to house just a few master pieces, among them several paintings of Claude Monet’s “Water Lilies” series. “When we created this Claude Monet space we tried to imagine: What would Monet have done with it? Exposing the paintings to natural light – that is the answer,” Kasahara explained. From the winter paradise of Nagano to the stunning Seto Inland Sea with all its treasures, Japan has a multitude natural wonders artistic riches to offer visitors. If you’d like to see any of our reports again, check out our website.